As stated yesterday, Phantom Wing opened tonight. I am glad I went this evening. Unlike the Wreck City event this project as a group, was more resolved in my mind. Having less artists involved helped raise the bar on this project and not serve as a dilutive effect, in terms of impact. One of the first things that I noticed was how magical the small enclosed outdoor courtyard is at night. A lot has happened in that courtyard since I was last there. It has been cleaned up, but it also has a lot of art put into it as well. 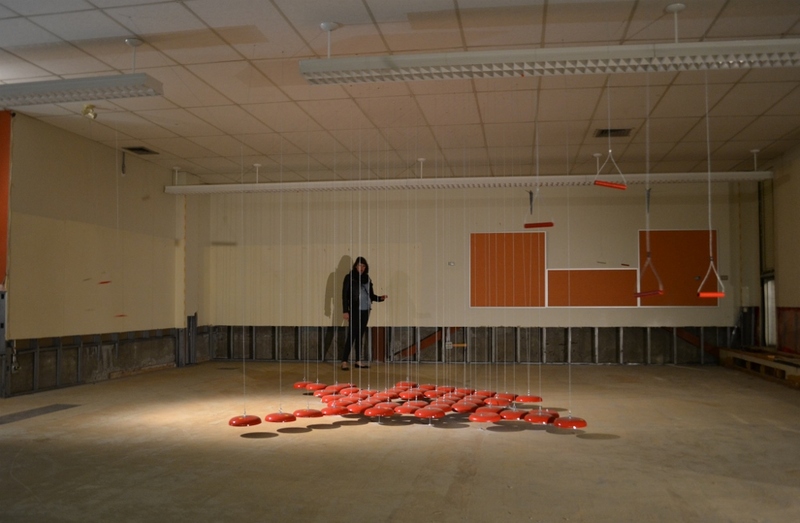 Two artist groups have transformed the space, Joanne MacDonald is one of them with kinetic sculptures using found objects that bears some resemblance to playground equipment. When I entered I found two young girls playing on one of the art pieces while the courtyard was filled with their laughter and screams of joy – which must be one of the happiest sounds I know. She was joined by a group of three artists; Alia Shahab, Lane Shordee and Ivan Ostapenko working in collaboration with a group called ANTYX who together created a water feature using materials salvaged from flood waters this past spring. The connection to the community, even though the community the school resides in was not affected by the flood, was interesting. If planning to attend, I would strongly recommend attending in the evening especially if you are interested in seeing the garden. It definitely benefits from the low and artificial light, unlike the rest of the complex where it would not matter as much. One of the highlights for me and what I feel most motivated to write about at this time is the sound installation by Leslie Bell and Chris Bell. The irony of the artist’s names was not lost on me, given the medium they used – a large collection of red alarm bells. As seen in the picture above, one of the curators Natalie MacLean, is interacting with the installation. There are approximately 50 bells of varying sizes, all suspended by individual filament wires suspended from the ceiling in what used to be the main floor library. Some of these bells are attached to handles also suspended from the ceiling, which use a pulley system to make it possible to guide the bells and create various levels of sound in so doing. I noticed the installation when I first arrived and was very intrigued by them. As a sidebar, the concept of “ringing a bell” is interesting. Throughout cultures and time, bells have held a lot of symbolism and significance. They serve to summon, warn, celebrate, cleanse and communicate. At first, there was a large number of people around them, so I did not feel inclined to fight my way in to interact with the bells. Fortunately I came late. By the time I was leaving, I was more or less alone with the bells and could interact with them as I wanted with the quiet to appreciate the nuances found in them. I found the work meditative, calming and contemplative as I heard the sounds I created, dissipate and fade into silence. The bells also brought back memories of a performance I heard at the Sound Symposium in St. John’s, Newfoundland (http://www.soundsymposium.com/) a few years back. Like the sound in the bells, the addition of the school also was once full of sound of children’s voice, laughter, and cries of joy – and the related occasional sounds of temporary pain and crying. Like in the courtyard garden, those sounds also will dissipate over time as the demolition crews destroy this part of the building over the next few months. As such I thought this one of the most thoughtful additions to the project. For this piece alone, it is worth it to attend – preferably with very few people around. This entry was posted in cSPACE, Gardening, Phantom Wing, Sculpture, Wreck City and tagged Chris Bell, cSpace Projects, Leslie Bell, Music, Natalie MacLean, Phantom Wing, Sound Symposium, Wreck City. You’ve captured the essence of both installations (courtyard playground and the bells) so beautifully….I had such fun with the interactive mediums many made use of. WELL DONE. Thank you. I am glad you were able to enjoy it as well.